Another factor to help you decide the color of the saree you might want to choose. If it is going to be a daytime affair, you might want to opt of lighter shades of pink, peach and maybe greens and blues. For a night ceremony the bridal colors of red, magenta, maroons, pinks, rust orange – there is no dearth of choice. Tall or short, plump or skinny – there is a saree for each one of us. Select one for your big day so that the saree complements you perfectly. 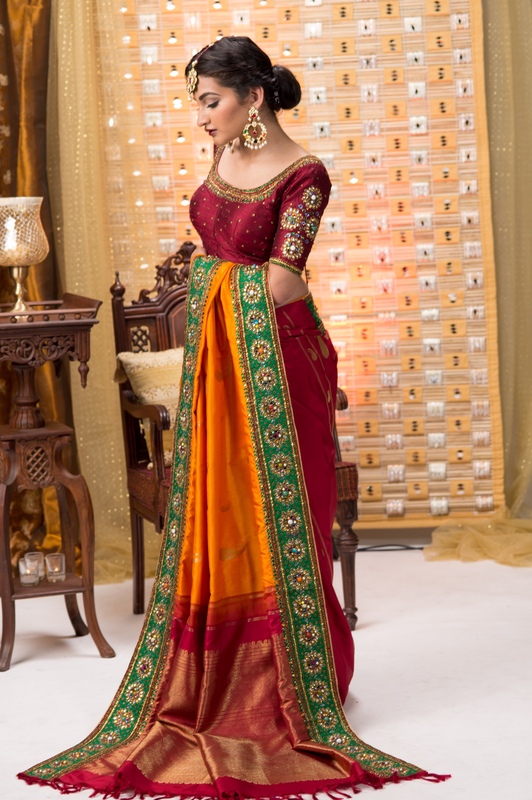 After all you wouldn’t want the saree to be stealing all the attention from you on your day! For the tall ones, a kanjeevaram is a safe bet as it is easy to wear and looks really elegant and graceful. Pure and raw silk sarees with trendy borders are a good pick if you want a trendy look. For the ones on the smaller side, choices are galore. Kanjeevarams with pastel shades and narrow borders, chiffons, georgettes, crepes – just take your pick. For the healthier ones, go for lightweight sarees like chiffon, crepe, georgette that will make you look slimmer. Dark colors with light borders also camouflage the chubby look. If your figure is on the slimmer side, opt for heavy sarees like brocade, tussar, silk or kanjeevarams. These will enhance your slim figure. Definitely a major factor, make sure the designs and fabrics you have chosen fall within your budget. Finalize accordingly. The choice of fabric plays a crucial role in determining your bridal look. Apart from your body shape and type, the choice of fabric should also be linked to your comfort level. After all you would be sitting for quite a few hours during the wedding ceremony. Another point to note here is the fabric can hold that long without messing up. Here you are again going to be spoilt for choice. 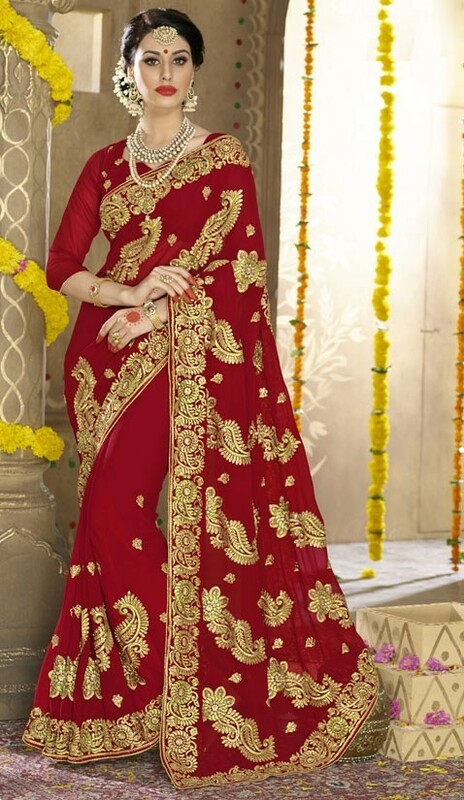 Bridal sarees are no more limited to the traditional colors of red and pink. There are various shades of the same available along with other beautiful colors. You can also zero down on a particular color based on your complexion. This is a personal choice. But remember extremely heavy sarees are cumbersome to manage during the long rituals. The weight of the saree can weigh you down and tire you eventually. 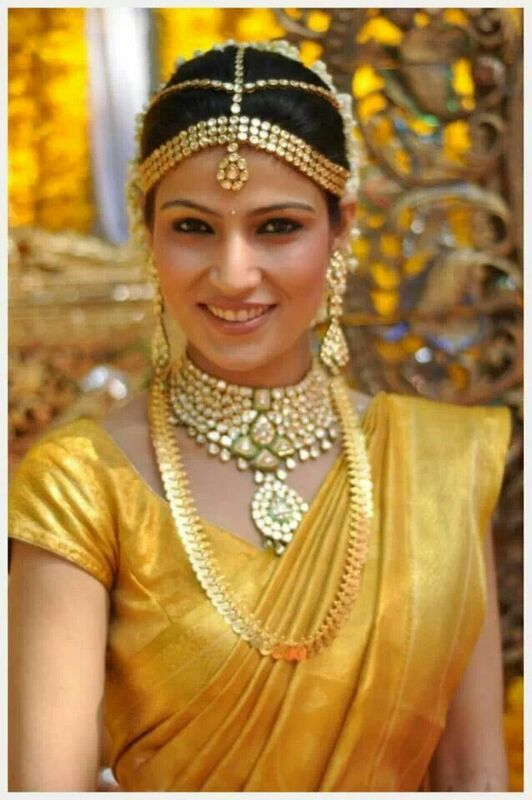 The most important accessory to the saree, a good blouse can add more life to the overall look. The fitting, neckline, fabric are important aspects, when making a blouse. You can even opt for contrasting colors. Customizing the fabric, embroidery and design can cost a bit higher than the readymade ones. If your budget permits then it is always a good idea to go for a customized one, as it will be one of its kinds, just as the bride on that day. 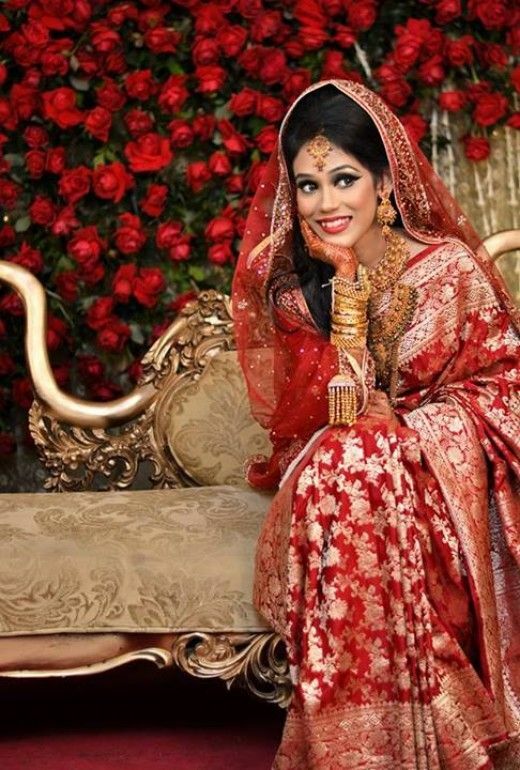 Getting the saree right is not the end to the beginning of your big day, girls. It is also about your grace and poise. Combined together, it will be none other than you the bride, the cynosure of all eyes.